I bought my wife a pair of nice gold and platinum earrings because she put up with me for so long, and a bottle of expensive bourbon for both of us. When I’ve got a book going, I try to spend several hours a day working on it. Usually do research in the morning. In my case, that means using the internet to find print sources in books and newspapers, and then chasing those down in libraries and used book stores. I write notes, outlines and very rough first drafts in spiral-bound 7x9 Project Planners with hard cardboard backs. I type them into the computer quickly because if I leave them alone for any time, I can’t read my handwriting. It is a time-consuming process. I do not recommend it. Nick Charles. He knew all the best speakeasies and had a lot of good stories to tell. Maybe he’d bring Nora. The three of us would be exceptionally stylish. “Good writing isn’t writing; it’s rewriting.” Louis D. Rubin told me that when I was an undergraduate. It took me years to understand exactly how true it is. The Fools In Town Are On Our Side (1970) Ross Thomas’s best and longest book is a sort of retelling of Red Harvest, about ex-spy Lucifer Dye who’s hired to drive one bunch of crooked bosses out of a Southern town and turn it over to another bunch. It’s a superbly plotted portrait of American crime and politics in the late 1960s. A Deadly Shade of Gold (1965) John D. MacDonald’s fifth Travis McGee novel is one of his most complex in terms of both plot and morality. The action moves from Florida to New York to Mexico and Los Angeles. A surreal Hollywood party at the end must be partially autobiographical. 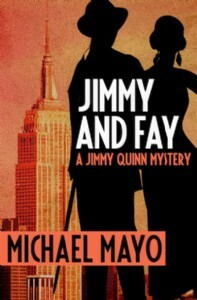 Jimmy and Fay, the new Jimmy the Stick novel, is available now! Get it right here.